GPL provides a search bar on every page of this website located just under the header for each page, clearly labeled “Online Catalog” and colored a unique green. Search the Westchester Library System’s catalog using a keyword, author, title or subject. Click on the title to see which libraries own the item. To reserve an item, you first need to search the Westchester Library System’s (WLS) catalog. Have your library card handy. After you have found your item, click on the “Place Hold” link and follow the directions to place a reserve. You can renew or review the status of items you have checked out, as well as determine what you have on hold, from your telephone. Have your library card handy; your PIN will also be required. Call TeleCirc at 674-4169 and follow the prompts. Library cards will be issued free of charge to individuals residing in Unincorporated Greenburgh. Persons who do not reside in Westchester County, but work or are students in Unincorporated Greenburgh are eligible for a free library card. Check your residency here. 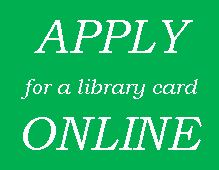 Library cards are issued to adults in person at the Greenburgh Library or apply online. If you apply online, your card will be mailed to you. Verification of Eligibility: Please see Library Card Eligibility and Identification Requirements. Library cards for children will only be issued IN PERSON, at the library. The identification of a parent or legal guardian is acceptable identification for patrons ages 12 to 18. A juvenile patron is defined as any person 12 years old or younger, and a parent or legal guardian’s signature is required before a card is issued. The juvenile patron does not have to be present. Library cards may be renewed in person with valid identification at the Greenburgh Public Library, or other libraries within the Westchester Library System. In order to replace a lost card, the patron must come into the library with proof of identity, proof of residence and pay a lost card replacement fee of $3.00. To provide a greater level of security and privacy, you will be required to log-in to the online library catalog using your library card number and a personalized identification number (PIN) before viewing information about your account or to place a hold. Your PIN will initially be the last 4 digits of the phone number on your library card account. To verify or update the phone number on your library card account, please call or visit your local public library. Westchester Library System (WLS) encourages you to change your PIN to something that will be easy to remember, but that only you will know.